How do you take a 20th-century brand of bottled water for infants and help it become the leading national brand in the 21st century? Easy as ABC, thanks to an educational and interactive creative approach – and a cast of friendly characters from a famous neighborhood! 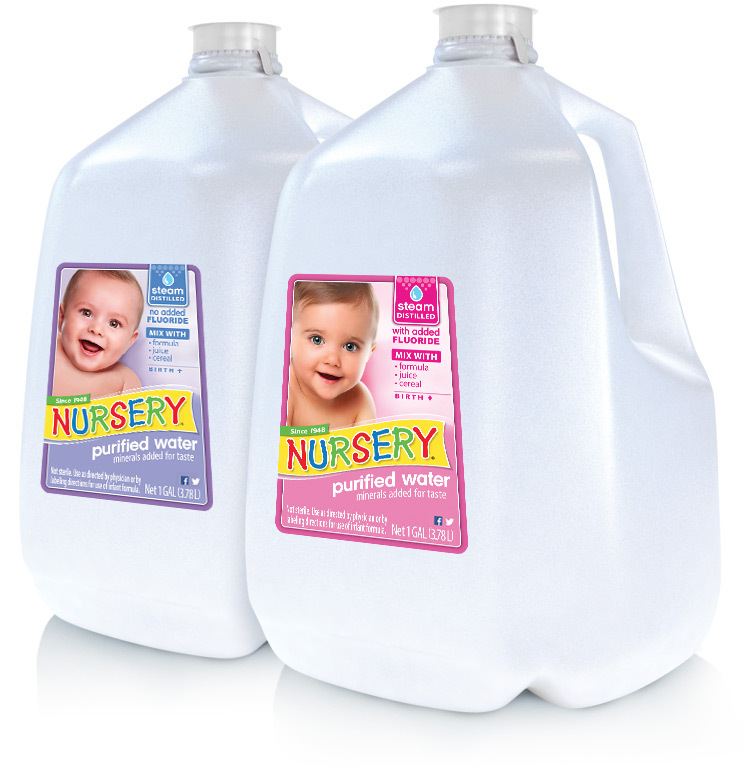 The Nursery® water brand was leading the infant water category by the late 1990s – but with retail distribution focused only in the Midwestern U.S. To grow significant national presence for this legacy brand in the dawn of the Digital Age, DS Waters enlisted our help to develop a multi-year strategy that would ultimately expand distribution into multiple retail channels including club, drug, convenience, grocery and mass. Our efforts would begin with the product itself, by redesigning the 1‑gallon packaging to better communicate brand heritage, key product attributes and usage. This was soon followed by a complete overhaul of the website that allowed for information-rich content to educate mom on her child’s life stages, as well as medical advice from a registered nurse. Now the challenge was to create long‑term loyalty. Thanks to extensive consumer research, we learned the product life cycle of Nursery water was 12 to 18 months. 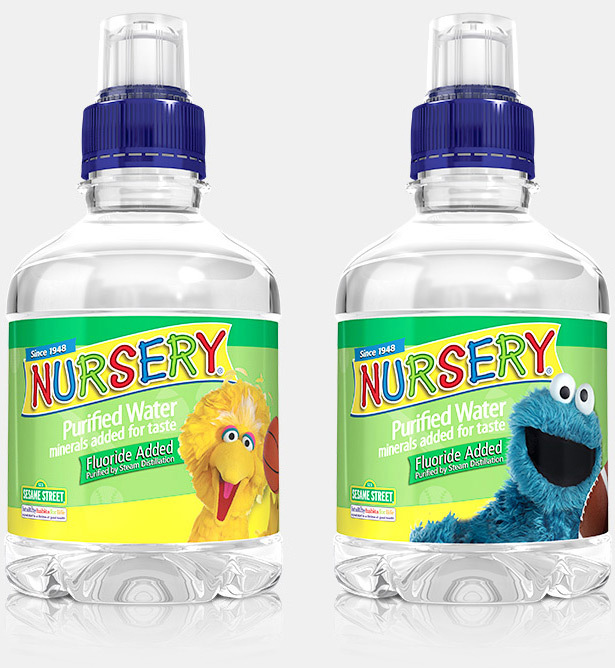 With this in mind, we pursued a licensing agreement with Sesame Street to drive new designs for single‑serve packaging that featured some of the show’s favorite characters (a hit with toddlers). With a national integrated marketing mix that consisted of pre- and post- natal traditional print, sampling, direct mail, digital, social media, eCRM programs, experiential and medical marketing, we were able to further push the brand to the forefront and own the category with more than 93% market share and dollar volume. 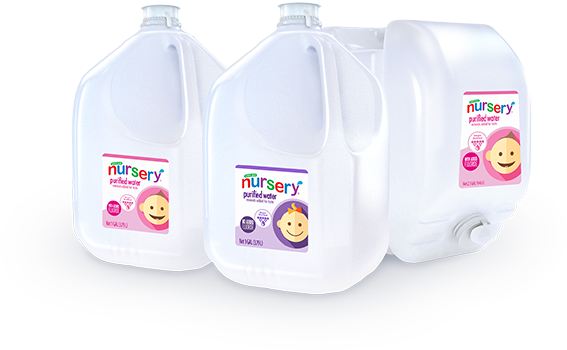 Thanks to extensive consumer research, we learned the product life cycle of Nursery water was 12 to 18 months. With this in mind, we pursued a licensing agreement with Sesame Street to drive new designs for single-serve packaging that featured some of the show’s favorite characters (a hit with toddlers). Package redesign of the 1-gallon bottle and label was key in helping to breathe new life into an iconic brand that was beginning to show its age. With a combination of fresh colors, photography, graphics and a simplified design approach, the 1-gallon bottle was given a much-needed facelift that better reflected the Nursery water mission and promise to consumers. When the opportunity to make over the packaging arose, it also made sense to look for opportunities to capture new revenue from emerging markets, and so the product line was extended. 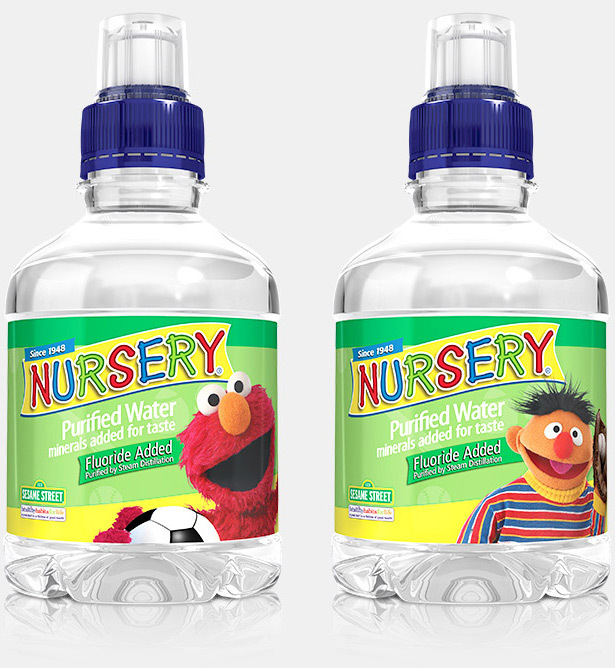 Refreshed POS materials were key to reintroducing the brand to moms and dads to better explain why Nursery water was essential to their babies’ development. Besides allowing for bilingual messaging to help target the growing Latino population in the U.S., it also provided a great incentive to purchase products with money-saving coupons. 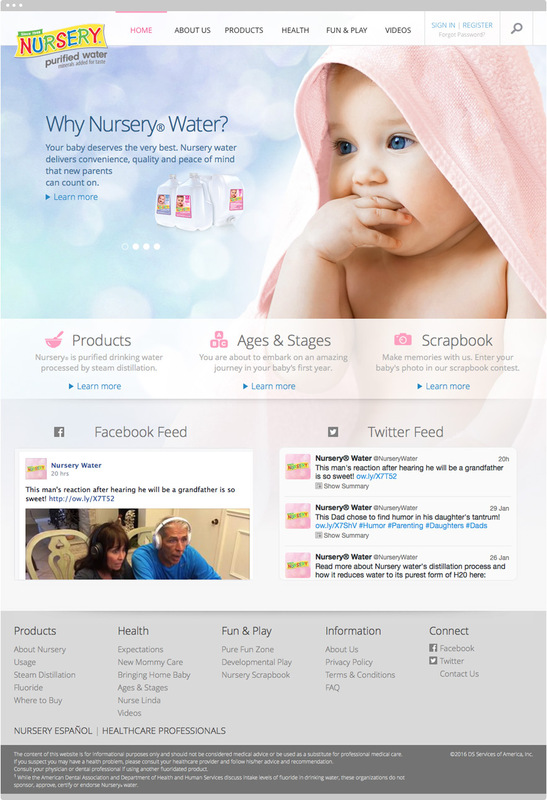 With a new product design on the shelves, we turned our attention to the online consumer experience – understanding that every aspect of the rebrand had to look and feel cohesive across every element, especially the Nursery water website. When we set out to redesign the Nursery site, we knew the most important change would be creating a richer and more informative experience for online consumers. Now moms and dads could have a place to visit that covered everything from product descriptions and life stage information to Nursery’s social feeds and advice from professionals. Increasingly, consumers are jumping online to learn more about products and information that can improve their family’s health and wellbeing. To facilitate their search on the Nursery Water site, the entire user experience was mapped out to ensure direct access to every aspect of the site—with clear, concise information on every page supported by easily understood graphics. Creating a section on the new site where Linda Ciampa, an award-winning journalist and registered nurse, could serve as a reliable resource for parents was key to reinforcing the brand’s new position as a trusted partner. 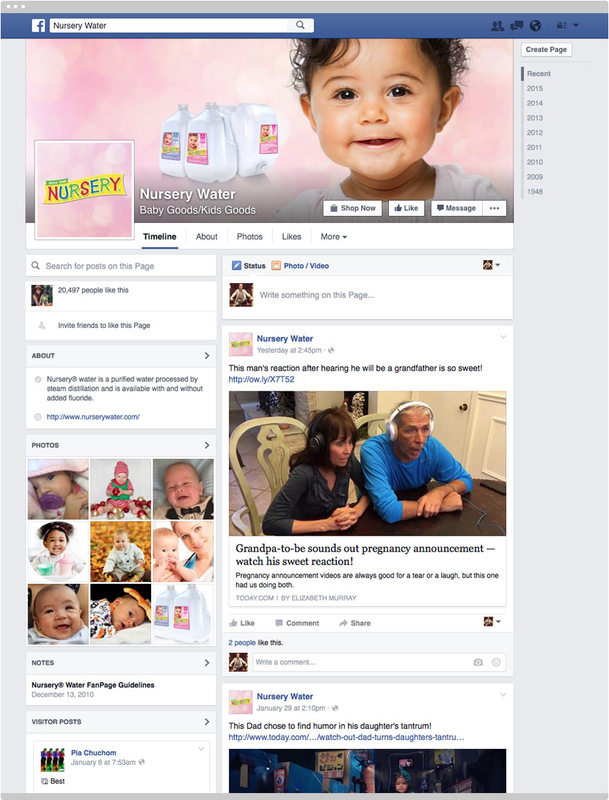 Whether sharing information about whooping cough or the best way to handle baby hiccups, Nurse Linda makes nurserywater.com an online resource that’s worth visiting time and again. 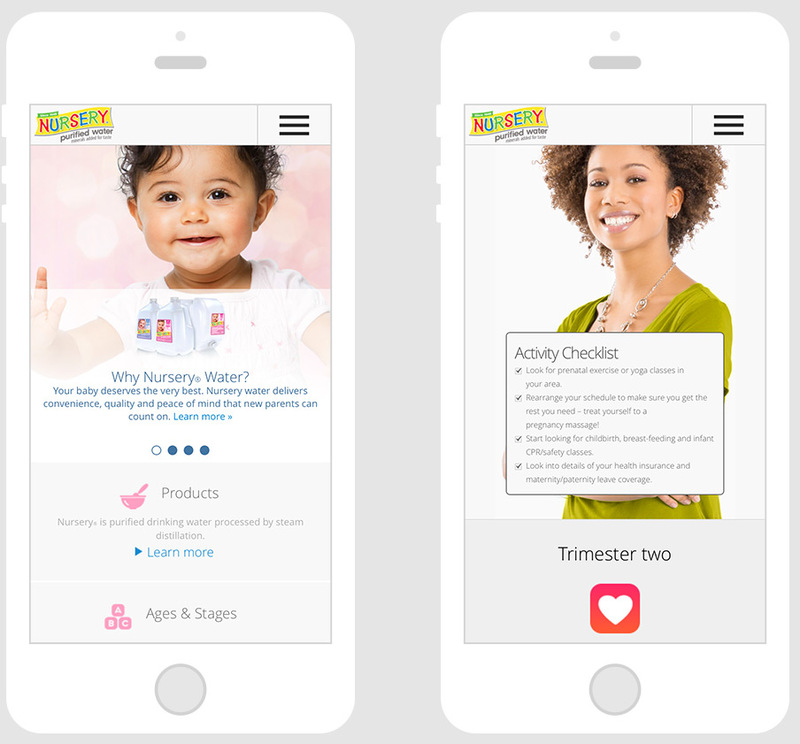 Delivering a mobile-friendly online experience for Nursery water was just as important as the one we created for desktop, especially with more parents using smartphones and tablets to check information and make online purchases. 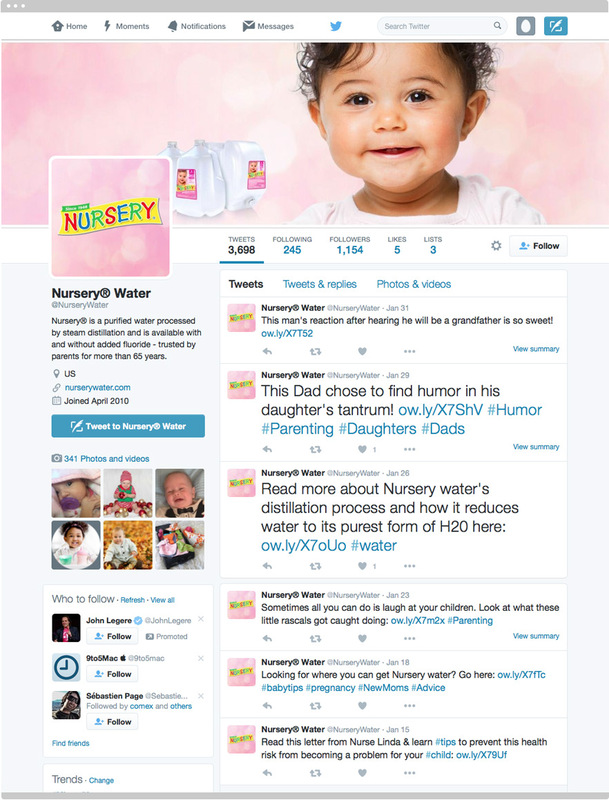 Social media strategies for both Facebook and Twitter were implemented to keep Nursery water top of mind with their consumer base – creating a public space where new information could be quickly pushed out real time to keep the conversation going throughout the year.